Just before E3 Witcher creators CD Projekt RED held a little private press conference to show off The Witcher 3 for the first time. While the gameplay was stunning, there was something else that stole the show. The Witcher 3 had its Collector’s Edition announced, and it was beyond stunning. I’ve been lurking on online retail websites for the past few weeks now, waiting for the Collector’s Edition listing to appear. 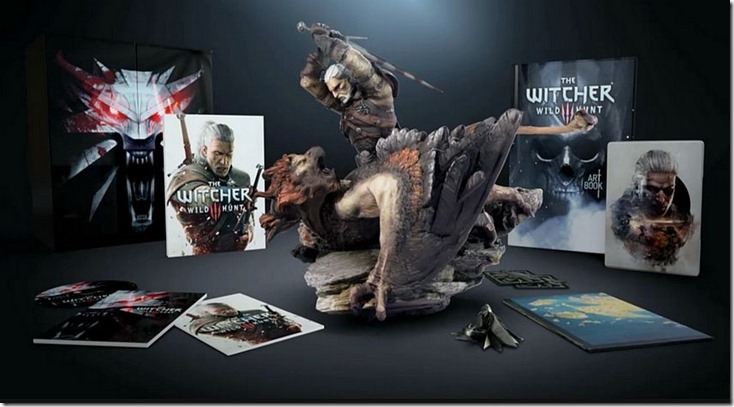 Last night, I noticed that local online retailer Kalahari.net has the Witcher 3 Collectors Edition up for pre-order. The only issue is that they have extremely limited stock. That, and the fact that it’s quite expensive. Definitely not a surprise considering how much stuff comes in the massive box, and certainly not too expensive for most Witcher fans. So if that doesn’t scare you off and you want to make sure that you receive a nice package in February next year, then you’ll probably want to get that credit card out right now. You can pre-order the PS4, Xbox One and PC editions here, with the PC version costing just a little less then the console counterparts. In case you’ve forgotten, here’s what the Collector’s Edition includes. Grab a drool bucket beforehand. Huge outer and inner Collector’s Boxes you can store your Witcher merchandise in! So what are you waiting for? There’s only fifteen copies left for the PC and PS4 versions, while the Xbox One version only has 5 left. Get clicking! Previous article Nvidia making its own PC streaming device?